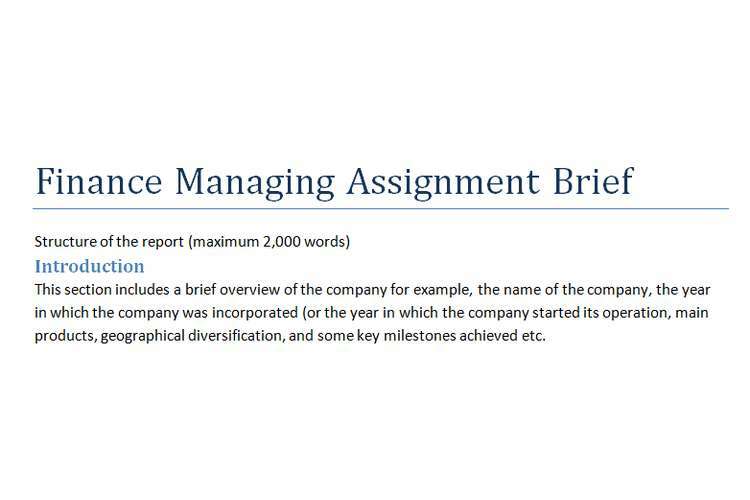 This finance management assignment brief section includes a brief overview of the company for example, the name of the company, the year in which the company was incorporated (or the year in which the company started its operation, main products, geographical diversification, and some key milestones achieved etc.The organization of the report. For example, this report discusses the governance and performance of X Ltd and the report is organized as follows. Section 2 describes the management and directors, Section 3 explains the ownership, Section 4 discusses compensation, Section 5 covers performance management, and the final section, Section 6 concludes the report with some practical implications. This section includes characteristics of the CEO and the board of directors over the last three years. The information included is at the Company level. Please do not cover every director separately. I have provided you with a template for information needed for directors.. This section discusses the major owners and their role in the governance of the company. This section explains the compensation structure of the company. Particular attention needs to be on the incented compensation of the CEO and the board of directors. Stocks and options offer incentives to the CEO and directors. The objective of this section is to evaluate the performance of the company by comparing its key performance indicators with the industry averages of the performance indicators. The industry averages are available from the IBIS World database. This section concludes the report by identifying the strengths and weaknesses of the governance structure of the company, and offering suggestions as to the areas for improvement. OZ Assignment Help providing cheap and reasonable assignment service in Australia. We have professional writer team which help to solve the assignment problem. We follow those criteria for writing assignment which is set by the Australian universities and other educational institute. We are providing all subject assignment services at very affordable price and students getting customized assignment as per their requirements.